With four different Heritage Walking Trails to choose from, Guildford has something for everyone. The Town of Guildford forms part of the City of Swan and together with the Swan Valley Visitors Centre offer a series of popular and fascinating Heritage Walking Trails. 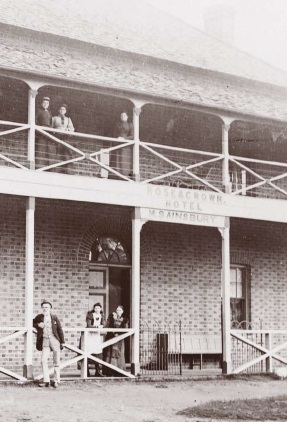 The Town of Guildford was established in 1829, during the founding of the Swan River Colony. 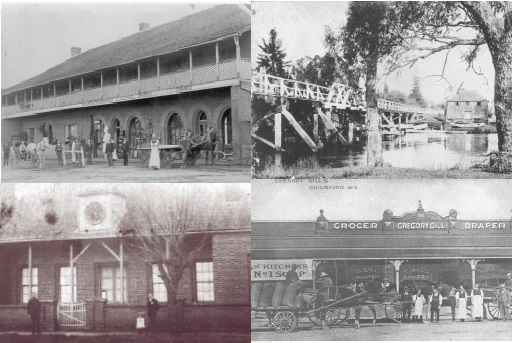 Built to resemble an old English village, Guildford was a thriving market town and an inland port linking Perth and Fremantle to the country districts. Today Guildford is a busy town full of history and the gateway to the Swan Valley. You can learn all about the fascinating history of Guildford by taking on of the free, self-guided Heritage Walking Trails. Meander through the streets and parklands and take in all the rich history Guildford has to offer. A town full of historical buildings, markets, colonial architecture, old hotels and pubs, quaint tea rooms,shops and galleries and antique shops, Guildford attracts thousand of tourists each year. The Captain Stirling Walk. The longest walking trail at 2.25km long (75 minutes to complete) this walk takes you past the Rose and Crown Hotel, Woodbridge House, the cemetery, the courthouse, the chapel, the showgrounds and old workers cottages. The Town Walk. This walk is 1.8km long (60 minutes to complete) and includes the Stirling Arms, the post office, the town hall, the courthouse, the railway, Du Cane's House, Kings Meadow and Alfred's Kitchen. The River Ramble. This trail is 1.5m long (50 minutes to complete) and takes you from the town to the river. Along the way you will see the warehouse, courthouse, hotel, Moulton's Landing, Moulton's Cottage, Garden Hill, Barker Bridge and much more. The Stirling Square Circuit. This is the shortest walk at 450m long (20 minutes to complete) and takes in the best of the historical town centre. See the Taylor's Cottage, the courthouse, the old jail, the warehouse, the church and the park. Each one of the fascinating Heritage Walks is a slightly different length and takes different times to complete. You can do the walks at your own pace, there is no time limit. To take one of these Guildford Heritage Walking Trails simply download the free brochure, choose a walk, and off you go. Follow the directions and the coloured markers as you take a historical journey. The free brochure is full of interesting facts and information to make your walk even more enjoyable. Each walk starts at the Guildford Courthouse and shows you the gorgeous old buildings and historical houses of yesteryear. 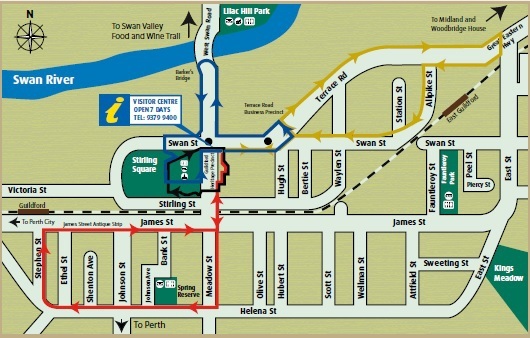 So head on over to Guildford and enjoy a Heritage Walking Trail self-guided walk. It's fun, it's interesting and it's free. For more information about the Guildford Heritage Walking Trails visit the Swan Valley Visitors Centre website.